The hand carving is that believable and exact in our Owl Ornaments it’s almost audible. The timber used is Mango Hardwood which is supremely workable and has lovely two tone colouring due to the large presence of spalting in the timber. It is also reclaimed from Mango Trees at the end of their useful fruit bearing life which helps to reduce deforestation of protected species elsewhere and provides an income for local people overseas. Each one is totally unique to the buyer and us. 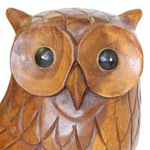 This owl ornament will look great around the home or outdoors with the resin finish adding to the attractive design and offering protection at the same time. Please call our Sales team in the Midlands for further information.